With a few options of places to go and people to be with on New Year's Eve we were pretty sure we would be busy doing something. Then it snowed. Like 5 inches (at least that is how it seems). We did NOT want to leave in the snow and drive on back roads to get to parties! So with a change in plans, we had our own little New Year's Eve party for our own little family; with a special Balloon Countdown for the girls. The countdown started at 6, and the girls were ready in their "party outfits." 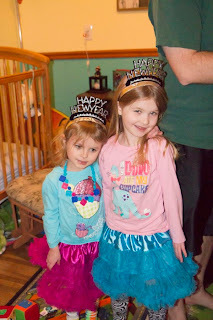 They also had little New year's crowns I had planned to take with us wherever we ended up. Start by rolling the slips of paper and sticking them into the balloons; then blow up the balloons! 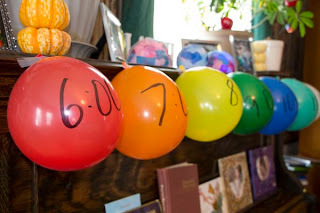 I had specific activities for specific times, so I wrote the time on the balloon as soon as it was blown up to prevent getting them mixed up. Then find a place to hang them up! 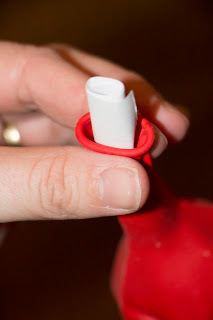 We taped ours to our piano, but a doorway would work, or hanging down on string. 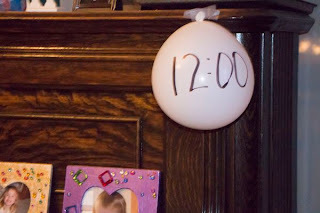 Now, I had to work some learning into our night of fun, so I made sure to set a clock out where the kids could easily see it. They got to watch the time, and let us know when it was time to pop the next balloon. 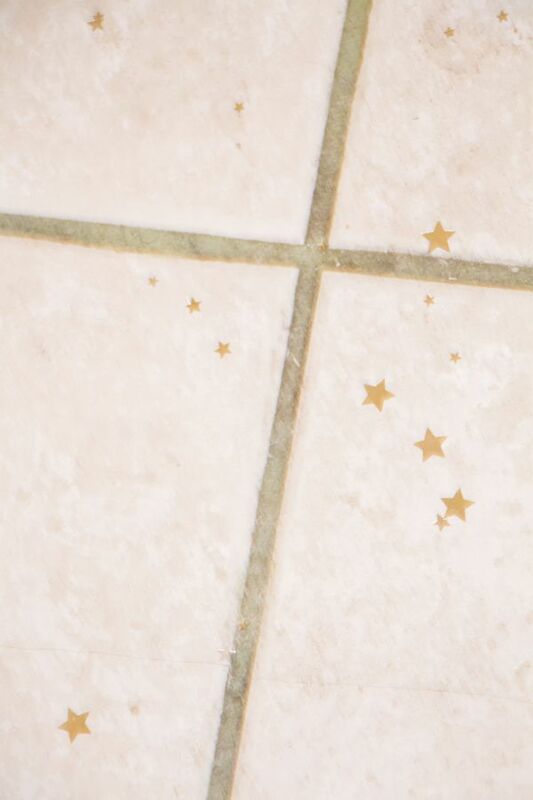 They didn't let us miss a single one either! 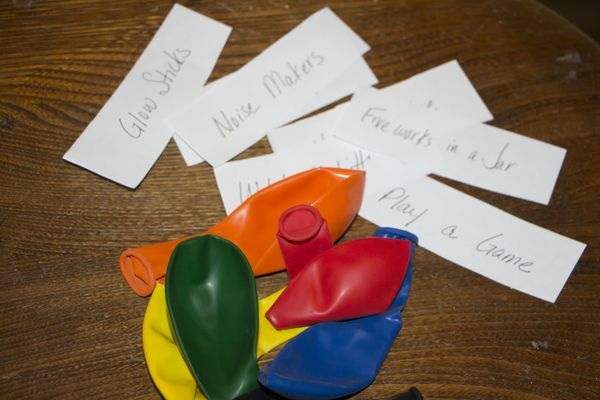 Since this was last minute, I came up with stuff we already had that the kids would enjoy! 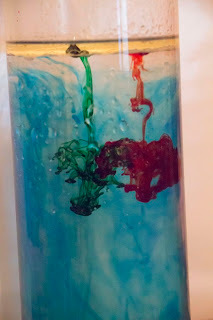 Balloon 1 (6:00): Play a game of Dixit . 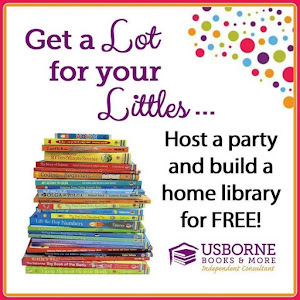 Balloon 2 (7:00): Watch the newest My Little Pony episode. 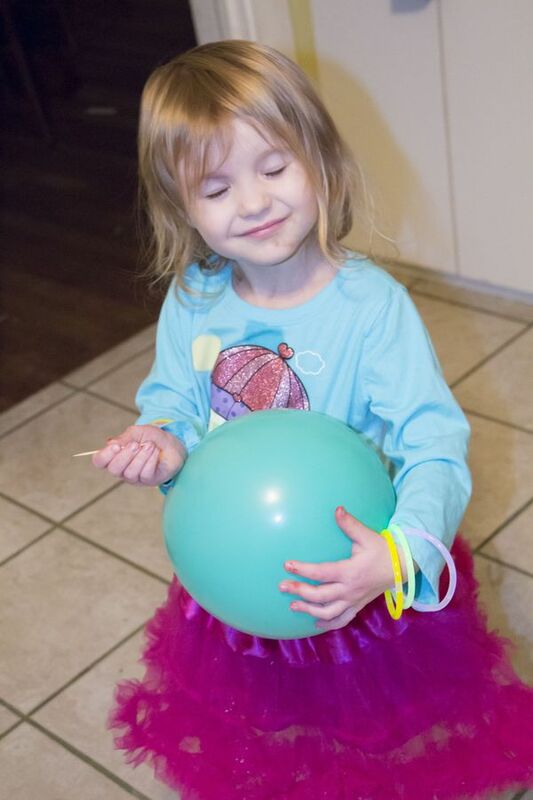 Balloon 3 (8:00): Help Daddy put together Lego sets. By balloon 3, I was seriously amazed by how fast time was passing. I am not a night owl anyhow, so New Year's is not usually so kind to me. This was definitely keeping me awake though! Balloon 4 (9:00): Fireworks in a Jar. 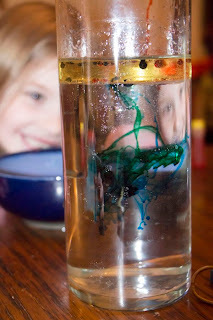 I had no idea how popular this would be especially at 9 pm, but we emptied and filled our jar 4 times! 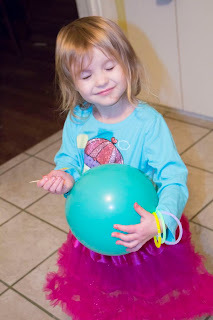 Balloon 5 (10:00): Glow sticks and a movie! 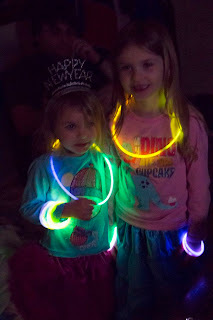 The girls love glow sticks, and this was a perfect time for them since it was a dark. They turned off all the lights and started a movie. Balloon 6 (11:00): Confetti! We started a movie at 10, so I knew we wouldn't want to stop and have an activity, plus we were hoping they would actually start to calm down a bit, so our 11:00 balloon was just filled with confetti. 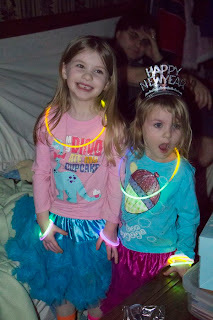 The confetti backfired a little because once the girls could see stars inside, they both wanted to pop the balloon. So I made a second one, and at 11:00 we took a break from the movie and got stars all over the kitchen floor. 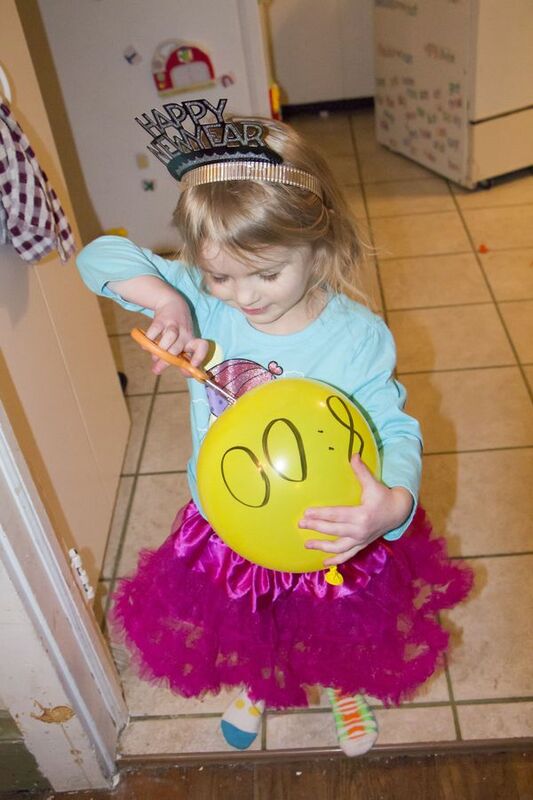 Balloon 7 (12:00): Noise Makers and Sparkling Grape Juice! 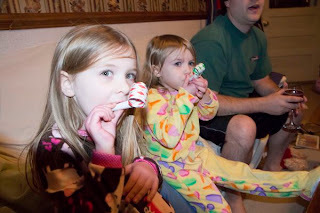 The movie ended, and the girls had just enough time to put on PJs and pop the last balloon before we needed our noise makers! They patiently watched the ball drop, noisemakers held to their mouths, and at midnight they went crazy! Not too bad really, but we did get lots of noise. 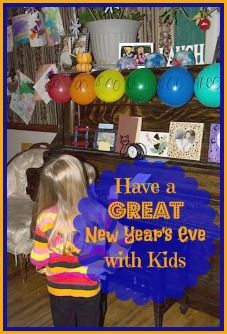 Then they each tried some sparkling grape juice (which they still didn't care for), brushed their teeth, and went to bed. Not what we had planned, but for me, it was the best New Year's Eve yet! Watching the kids with all the activities in their balloon countdown made for a really exciting and quick evening. 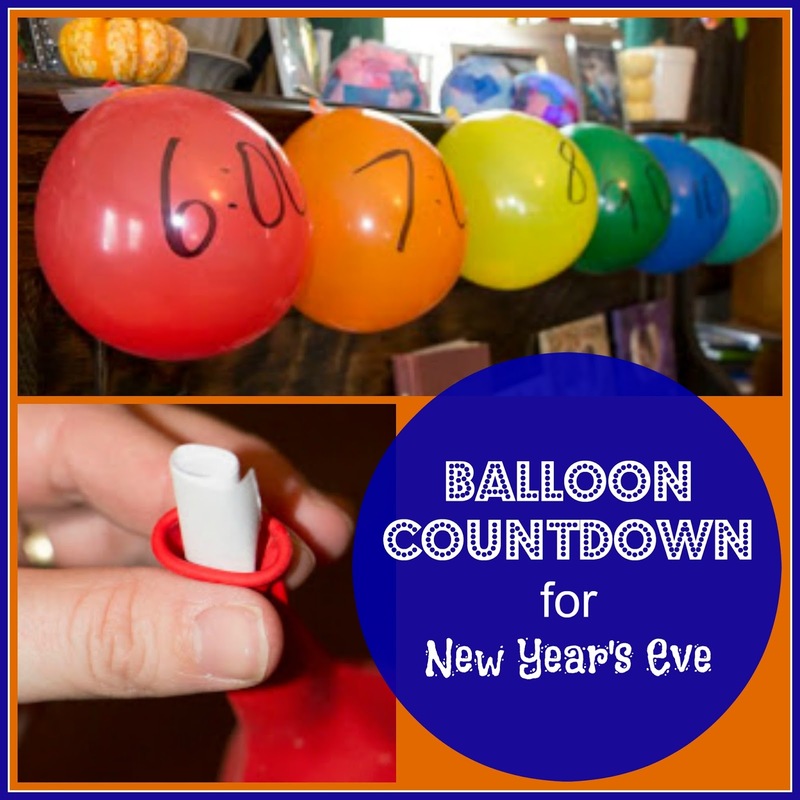 The New Year's Eve Balloon Countdown helped keep them awake and out of trouble, and allowed us all to enjoy New Year's Eve despite being snowed in; I'm sure it will become a tradition! 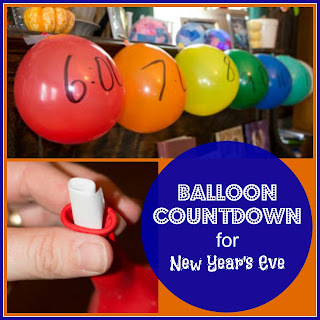 Check out all the festivities and our geography countdown for New Year's too and our New Year's Mystery Countdown!